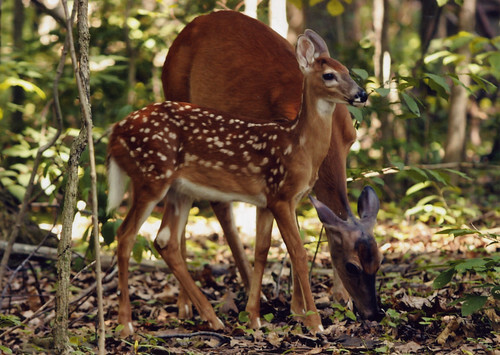 Late spring is the prime birthing time for white-tailed deer and the Maryland Department of Natural Resources reminds anyone who encounters a fawn to avoid disturbing it. While young deer often appear to be orphaned, in most cases, the doe is nearby feeding and will return to care of her young. Too often, people find and remove fawns from the wild, believing they are helping an orphaned animal, when in fact they may be causing great harm. For the safety of both humans and wildlife, removing deer from the wild and keeping them in captivity is against the law in Maryland. Newborn fawns have almost no natural odor and their spotted, reddish-brown coats help them blend into their surroundings. Fawns instinctively lie motionless when approached by potential predators. This seemingly helpless state is a behavioral adaptation that has helped white-tailed deer survive for ages. Despite this strategy, curious fawns will sometimes wander around new surroundings and may appear to be lost or distressed. Anyone with questions about fawns, or other young wild animals, is encouraged to contact the U.S. Department of Agriculture at 877-463-6497.